As of the 2010 United States Census, there were 64,669 people and 14,269 families residing in 21,570 housing units in Flower Mound. The population density was 1,562 inhabitants per square mile (603/km2). The racial makeup of the town was 83.9% White, 3.2% African American, 0.1% Native American, 8.6% Asian, 0.1% Pacific Islander, and 2.2% from two or more races. Hispanic or Latino of any race were 8.4% of the population. The average household size was 3.07 persons. According to a 2011 American Community Survey estimate, the median income for a household was $118,763, and the median income for a family was $126,336. Males had a median income of $95,284 versus $56,692 for females. The per capita income for the town was $44,042. About 2% of families and 3.4% of the population were below the poverty line, including 3.5% of those under age 18 and 1.1% of those age 65 or over. The town is mostly served by the Lewisville Independent School District. Other parts of Flower Mound are located in the Argyle Independent School District and Northwest Independent School District. The town is home to two high schools, Edward S. Marcus High School and the newer Flower Mound High School, both part of the Lewisville district. Private schools in the town include Coram Deo Academy and Explorations Preparatory School. In January 2011, North Central Texas College opened a community college campus in Parker Square in Flower Mound. 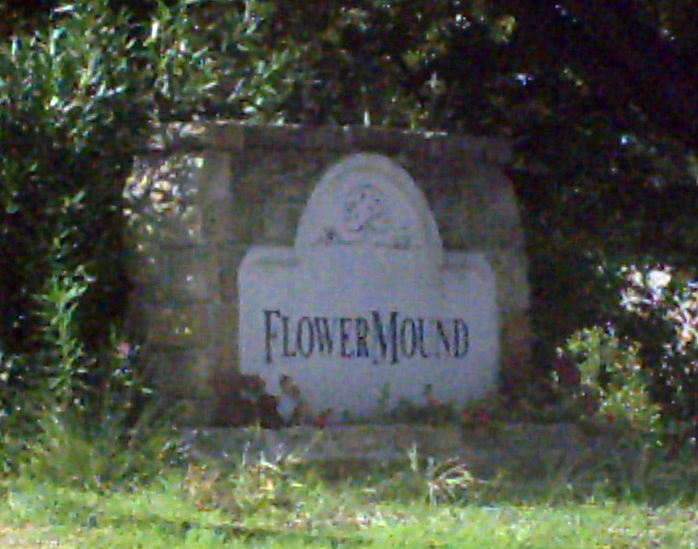 Flower Mound was named for a 12.5-acre (5.1 ha) hill approximately 50 feet (15 m) in height located close to the intersection of FM 3040 and FM 2499. The formation attracted the attention of early settlers to the area, and is often simply referred to as "The Mound". Part of the Texas blackland prairies, The Mound is typically covered by big bluestem, little bluestem, and Indian grasses. During blooming seasons, dozens of varieties of flowers can grow on its slopes, often aided by the water retained by gilgai formations. Though surrounded by commercial and residential development, The Mound is owned and maintained by The Mound Foundation, a non-profit private–public partnership. The group has advocated for a controlled burn on The Mound for many years, and it expressed relief when an accidental New Year's Eve fire in late 2011 spurred the growth of wildflowers for the first time in years.